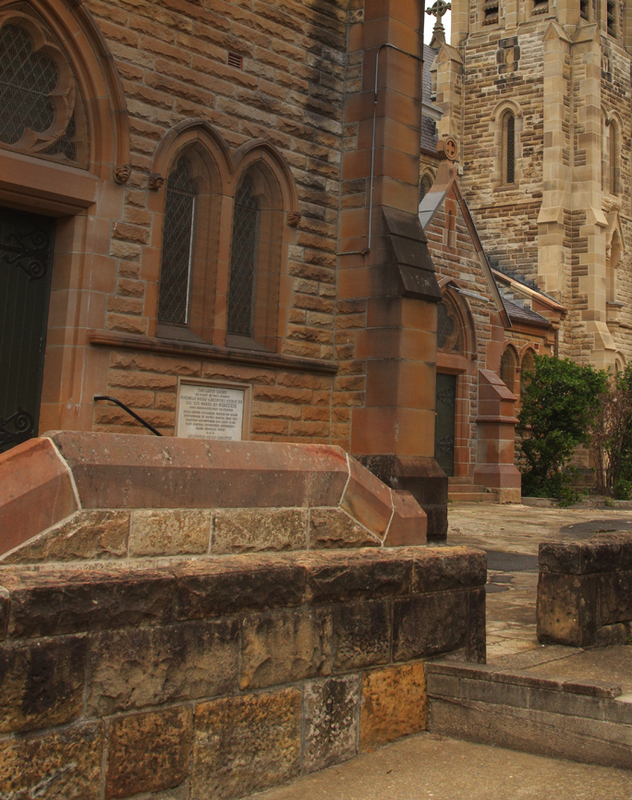 Lewisham's first Catholic church was built when the city of Sydney was less than 65 years old. In 1851, when this church was commenced, Lewisham was known as Canterbury and was a village some seven kilometres south-west of the centre of Sydney. It is thought that this early church was given its name because of the village where it was built, but hallowed by the name of the great English mediaeval martyr, Saint Thomas Becket, who was murdered in his own Cathedral of Canterbury in 1170. Subsequently, the district Canterbury became known as Petersham and Lewisham, all English names. window in the east wall of the sanctuary. Part of the two-room sacristy is shewn on the left. 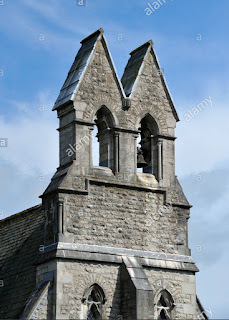 The old church was designated Saint Thomas of Canterbury when its foundation stone was laid in 1851 by the coadjutor bishop of Sydney, the Right Rev'd Charles Henry Davis OSB. Thus far, research has failed to reveal the name of the local architect and builder of Saint Thomas' church, but it is reasonable to assume that the design was derived from plans prepared for the use of the Catholic Archbishop of Sydney either by Augustus Welby Northmore Pugin or by Charles Hansom, the renowned Gothic Revival English architects. On Monday last, the first stone of a new Church at Petersham was blessed by the Right Rev. the Bishop Coadjutor, assisted by the Clergy and Choir of the Cathedral. The Church is to be dedicated under the invocation of St. Thomas of Canterbury. 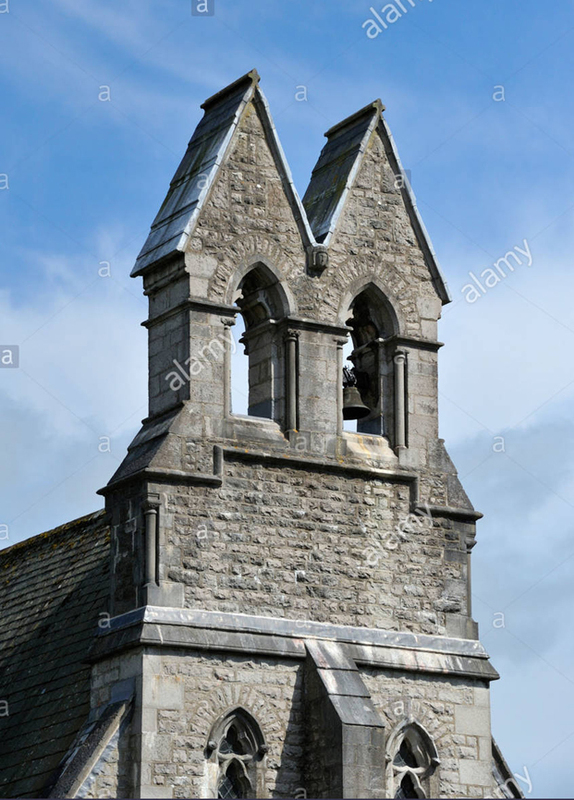 It will be of simple but strictly correct architecture in the Early English style, with nave, chancel, sacristy, and, we believe, a tower, and spire. The old church was not very large, but fine in its proportions and charming in its appearance. All its Gothic detailing was "correct" and well built. It comprised a nave and separate chancel, both made from stone, and roofed with slate. It had an entrance porch on the northern side of its nave, in the usual position for small churches of this design. A two-room sacristy with pitched-roofs projected from the southern wall of the chancel. Evidently one of these rooms was also intended to provide accommodation for the resident or visiting priest. No details have been uncovered of the appearance of the church's interior, but it is certain that the nave ceiling would have been of open-timber work, as all the pioneering Sydney churches were. of old Saint Thomas' church. Although there is a reference in The Freeman's Journal report of the church having a tower and spire, these were not part of the completed building. But the distinctive feature of the old church was a twin-gabled bellcote over the western facade. 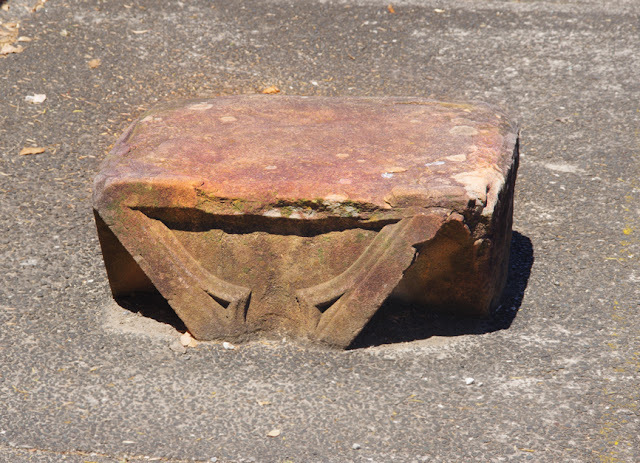 Bellcotes were not an uncommon feature of nineteenth Australian churches, but very few had the twin-arrangement. Two bells were hung in this bellcote. Old Saint Thomas' did service as the parish church for only 37 years before it was replaced by a larger stone church built a very little distance away. In those intervening years, however, a very large graveyard grew around the church containing the remains of around 4000 pioneering Catholics. Australia's first Catholic bishop, John Bede Polding OSB, was laid to rest in this cemetery in 1877. Many other pioneering Benedictine monks and secular priests were also buried in that ground, some of whom remain buried in the precinct. 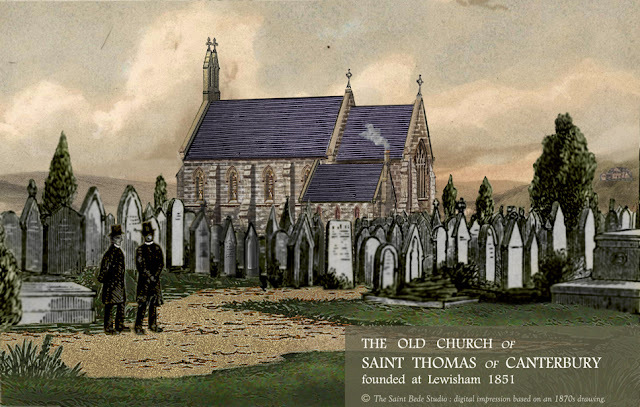 Old Saint Thomas of Canterbury's church, Lewisham, as it appeared in the late 1870s. Surrounding the church is the cemetery in which burials commenced from around 1865. Copyright of the Saint Bede Studio. Over the intervening years, all but a handful of those gravestones have disappeared, along with the handsome structure of Old Saint Thomas'. 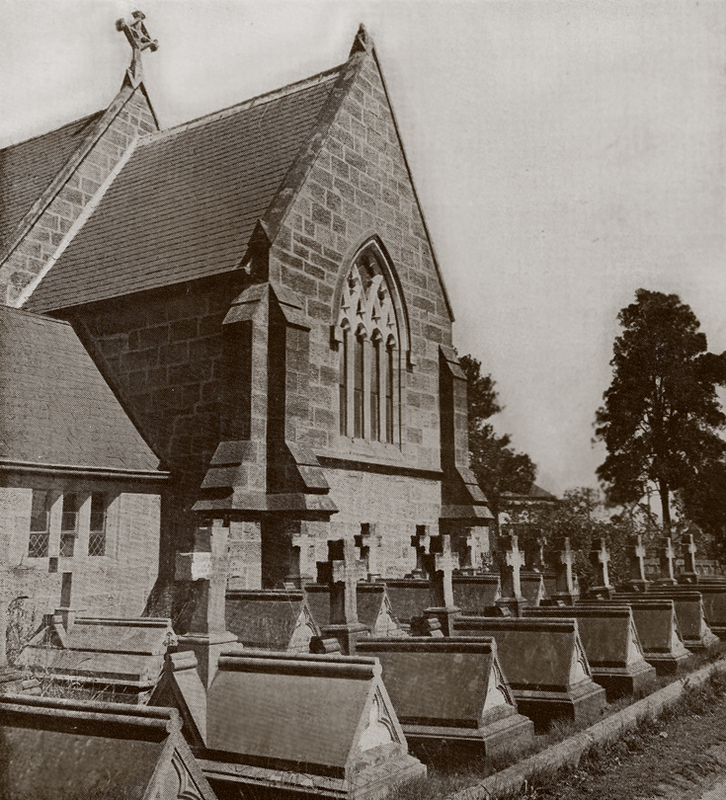 When it was demolished in 1939, its stonework was re-used to make substantial fences around the church ground which are everywhere in evidence today. from the stone walls of old Saint Thomas' church. the old church was taken down stone by stone. in one face of the stone, was carved on each of the four sides. or of the chancel, and can be viewed in situ at Figure 1.